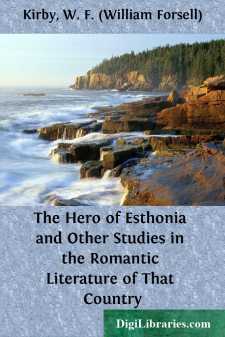 Esthonia, or Estonia, as some prefer to write it, is the most northerly of the three so-called German or Baltic provinces of Russia—Esthonia, Livonia, and Courland. It is bounded on the north by the Gulf of Finland, which lies between that country and Esthonia; on the east by the Government of St. Petersburg; on the south by Livonia, and on the west by the Baltic. Opposite its western coast lie numerous large islands, the most important of which are Dagö and Oesel; these islands nearly close the north-west corner of the Gulf of Riga. The northern part of Livonia (including the island of Oesel, already mentioned) is partly inhabited by Esthonians, and is dealt with in popular literature as forming part of the country. The four provinces of Esthonia proper, which are constantly referred to, are as follows, the German names being added in brackets. Two western, Arju or Harju (Harrien) on the north, and Lääne (Wiek) on the south; one central, Järva (Jerwen), and one eastern, Viru (Wierland). East of Livonia lies the great Lake Peipse or Peipus, eighty miles long and thirty-two miles broad at the broadest part, across which the son of Kalev is said to have waded to fetch timber from Pihgast or Pleskau, which name is used to include the Russian province of Pskov, bordering the lake on the south and south-east. At two-thirds of its length the lake is divided nearly in two, and the southern portion is sometimes called Lake Pskov. It may have been across the narrow part between the two ends of the lake that the hero is supposed to have waded, when, even during a great storm, the water reached only to his girdle. The coast of Esthonia is rocky, but the interior of the country is very marshy, though there are no navigable rivers or lakes of much importance except Lake Peipus, which we have already mentioned. Small lakes, however, are very numerous, the largest being Lake Virts. Esthonia was one of the countries conquered during the Middle Ages by the crusading German Knights of the Sword, and has been described as a country with a Finnish population and a German aristocracy under Russian rule. Occasionally we meet with reminiscences of oppression by the German nobility in the songs and tales; as, for instance, in the story of the Royal Herd-boy; while everything beautiful or above the ordinary life of the peasants is characterised as Saxon.